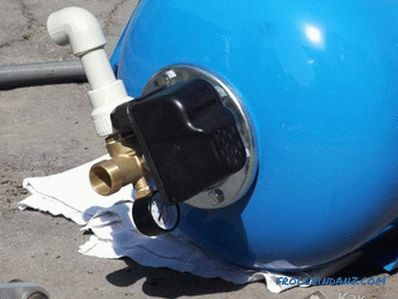 Any suburban housing owner knows that submersible-type pumping equipment is commonly used in well water supply systems. 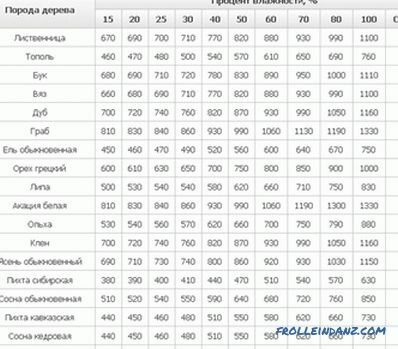 In addition, this equipment can be operated in the heating networks of private households. 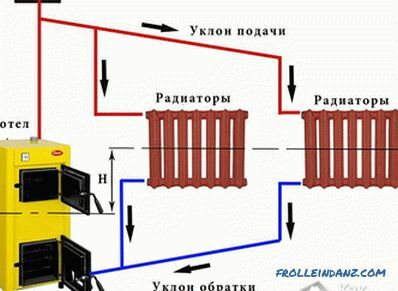 The so-called direct connection of the submersible pump to the power grid (without the involvement of auxiliary equipment) is quite simple and involves direct connection to its contact group of supply conductors, referred to as "phase", "zero" and "grounding". The use of automation elements installed in equipment power circuits will allow you to connect a submersible pump in such a way that the system will operate in automatic mode. The basis of this circuit is a contactor with a normally open contact group to the input which are supplied with power conductors (phase, zero and ground). 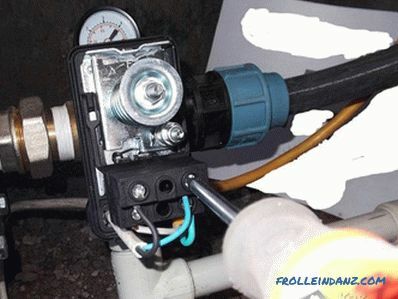 Well, the pump itself is connected to the output of the contactor, which receives power from the mains through it. The use of such a pump connection scheme assumes the presence of a special accumulator, which includes a check valve. It is in this unit that the pressure switch is installed, which controls the operation of the contactor group, which provides the supply and discharge of voltage from the pump. The entire system operates in automatic mode as follows. When the pressure in the system drops to the minimum level, the relay sensor gives a signal to turn on; at the same time, the working group contacts close the pump power supply circuit. As water enters the system, the pressure in the hydroaccumulator gradually increases. When the pressure reaches its upper threshold (limit value) by a signal from the pressure sensor, the contactor trips on shutdown. Its contacts open and the equipment is automatically disconnected from the mains. For domestic water systems designed for significant volumes of liquid, more suitable electrical circuit on the float sensors, providing automatic control of the level of liquid in the collection tank (hydroaccumulator). 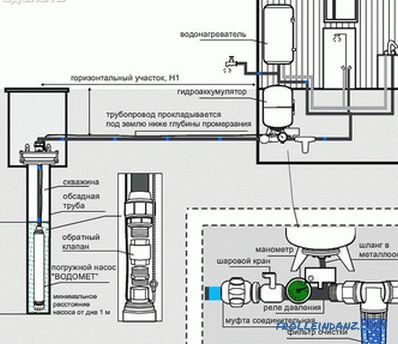 The schematic diagram of the connection of the pumping equipment in this case does not differ significantly from the previous one, except for the fact that instead of a pressure switch it is installed a liquid level sensor. 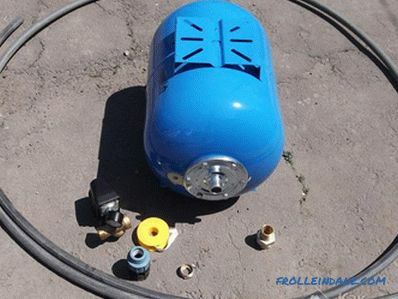 It is worth noting that to connect the power supply to a submersible (borehole) type pump, you will need special-grade cables. Waterproof wire under the designation runway or KVV is best suited for this purpose. Good performance for waterproofing is also imported cable brand AQUA RN8. 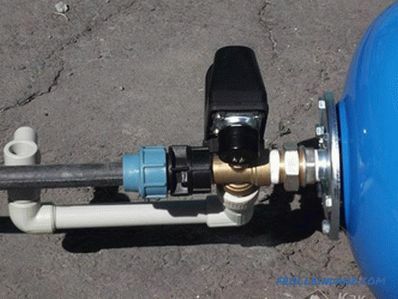 In the event that you plan to assemble a water supply system that would be started and disconnected from the water supply valve, you will have to purchase a special hydraulic accumulator used in conjunction with a pressure relay. At the same time, the automation connection to the pump can be organized from a concrete well located in the immediate vicinity of the well itself with the pump. plastic pipes, fittings, tape FUM. Basic assembly work on the assembly of the pump control circuit is performed As a rule, not in a well prepared in advance, but at the top, in open space. 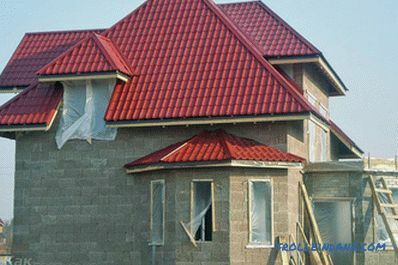 Upon completion of the assembly of this part of the structure, you can lower it to the bottom of the well, where in cramped conditions you will only have to connect it to the pump. It is customary to begin work on assembling the control and monitoring circuits by strapping the accumulator, while in order to reliably seal the connections and facilitate subsequent maintenance of the system, all threaded connections are sealed using a special FUM tape. 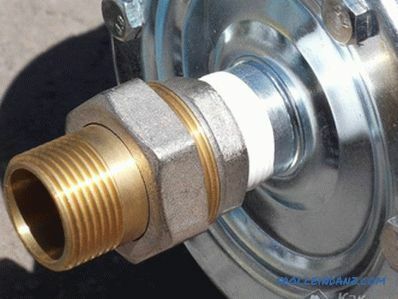 Note that the pressure switch is connected to the pressure accumulator not directly, but through a special adapter called "American". The use of a transition element makes it easy to dismantle the connection if necessary, and also greatly simplifies all operations for connecting and setting up automation. 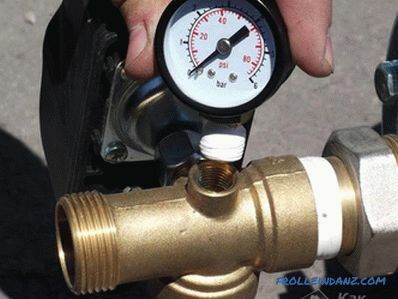 When installing a pressure switch, try to place it in such a way that, if necessary, you can “read” the pressure gauge at any time (without dropping to the bottom of the well). 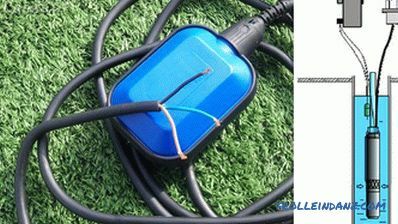 You should also pay attention to the fact that the reliability and tightness of the connection of the relay with strapping should be provided with a special gasket. 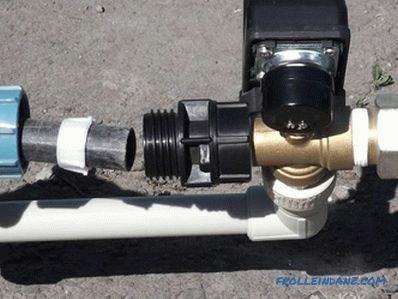 In the future, to form a consumer's tap branch (connected to the outlet from the pressure switch), you will need to make a special composite elbow brazed from the fitting and the plastic pipe section. 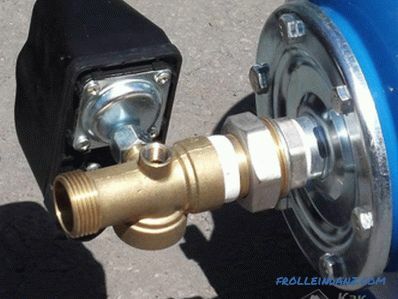 At the end of the plastic pipe, a coupling with an external thread (type MPH) is soldered, which is hermetically attached to the outlet from the pressure switch (see photo on the left). On this, the part of the work that should be carried out outside the well can be considered completed. All of the coming operation to connect the assembly to the pump will have to perform, being directly in the well. 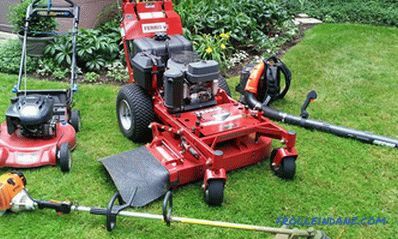 If necessary, you can break (unsolder) the existing wiring into two separate lines, one of which will go straight to the house, and the second can be used for watering the garden plot. 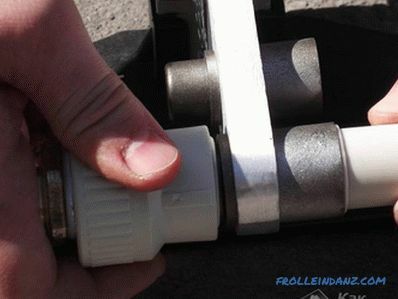 To disable this branch for the winter period, it is necessary to provide a separate shut-off valve. At the final stage of the installation work you need to connect the electrical part of the circuit to the pressure switch . 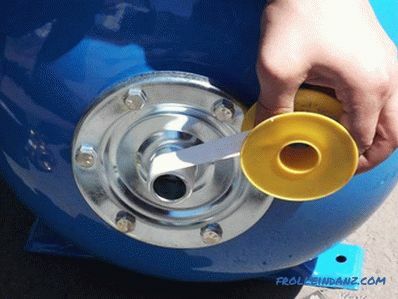 To do this, first of all it is necessary to remove the regulator cover, thereby ensuring free access to the connecting terminals of the device. In the lower part of the housing there are openings for the input of power supply wires and a signal cable from the pump. Carefully thread all wires into these holes and connect their ends to the appropriate terminals. Most often, the terminals for connecting the signal wire from the pump are designated as "MOTOR", and the terminals for connecting the network cable - as "LINE". Upon completion of these works, you will only have to replace the cover of the relay-regulator.